After exfoliating a layer or five off my face at the Horn, the Iceland wind had found its way into my hollow stomach, so we headed to Kaffi Hornið, reputedly the better of Höfn’s two restaurants open this time of year, a cabinesque place of soft light, clean chairs, and hearty food. 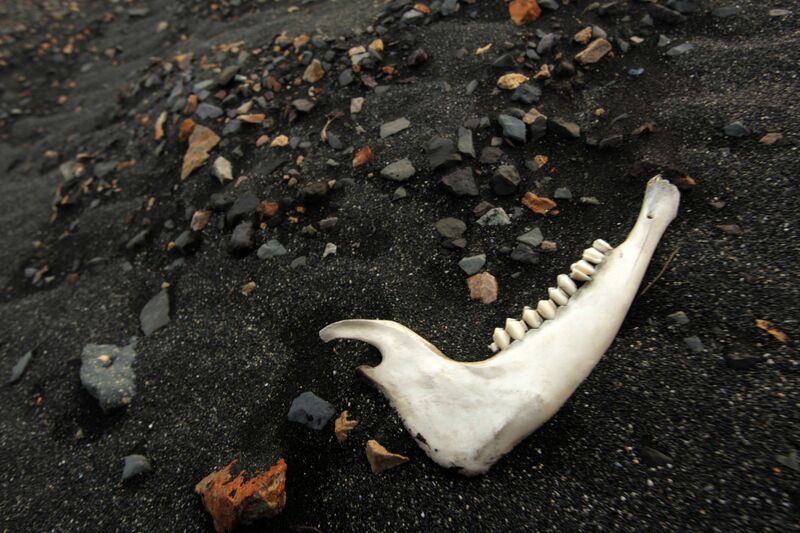 Hunger at the Horn is a terrible thing. I don’t eat much beef (I produce my own fair share of greenhouse gases, I don’t need their contributions on my tab), but a big ol’ burger and fries sounded perfect to me. But there, next to the beef, was a reindeer burger. I’ve never understood how we delineate which animals it’s okay/normal to kill and eat, Pulp Fiction rationales notwithstanding. And it seems like a good idea to vary one’s diet. Thus, I eat as many different critters as I get a chance to, except endangered animals of course, no shark fin soup for me. But mostly it’s the old principle, a guideline in life but a rule while traveling, that when given a chance to try something new…you should. Dang. I just wanted a big honkin’ burger, plain and simple, and this thing came with bleu cheese and onion jam. Onion jam? My last new eat-a-beast experience was lackluster. The alpaca in Peru was tough, tendony, and tasted only of the peppery sauce they slopped on it. I wasn’t expecting much from my reindeer, but at least they hadn’t named it something stupid like The Blitzen Burger, or Rudolph’s Retirement. Actually, that latter one’s not so bad. Culinary nostalgia. Can I order one To Go…halfway around the world? The pile of fries looked promising, but the bleu cheese oozing out the side was not especially charismatic. But once I started eating? Oh lordy. I can’t say I could distinguish reindeer from beef, but that burger was divine. The bleu sauciness and sweet onionyness… I’m not even hungry right now and I’m drooling. 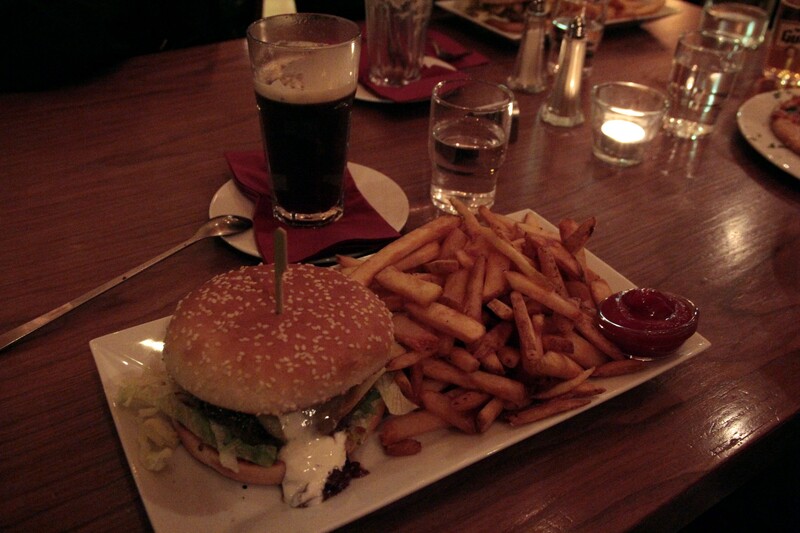 Burger, fries and beer, happiness. Totoburgers. Wonder how that’d go on a menu?